Telling myself that I'd just walk my usual 1.75 miles, but as fast as possible, I put on the sports bra under the warm clothes (just in case) and off I went. Very late in the day (nearly 6pm) - I should've gone out two hours earlier - but just made it in the light. 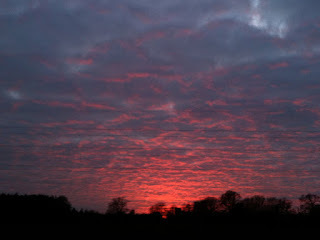 My first reward for going out was a fantastic mackerel sky that I otherwise wouldn't have seen. Of course, the real camera would have done a much better job than the iPhone, but hey. My second reward was to manage to break into a run, twice, which was (according to the iPhone Nike+ utility - sorry, I'm a geek) a sub-10 minute pace, even if it was only for a couple of minutes. The rest of the walk averaged out at around a 15 minute mile, which was fair enough. I've committed to running just one mile for Sport Relief in a fortnight's time. I've been too embarrassed to ask for sponsorship so far, and ditto the Race for Life 5K in May, which I've also entered. However, if I can make it down to Morton Hall in one hit in the next thirteen days, never mind back again, then the first one is covered without too much loss of dignity. And then - well, who knows? Back in 2007, I went from zero to a 5K in exactly the same period of time (in fact, less - my first ever run was made on 24th March for a RfL at the same weekend as this one will be). So I can do it again.